You’ve always wanted to go on safari. But the cost is truly enormous. You wouldn’t be able to take the time off work, let alone pay for the flights to Africa and back. But you do dream of watching the antelope run across the planes. See the lions lounging in the shade under a tree. But most of all you want to ride a wild(ish) elephant. You’ve wanted to ever since the first time you went to the circus as a child and they had elephant rides. You want to feel the beasts tough skin under your hands. Feel the heat rising off it’s back, and the strength of its muscles as you lift into the air. You want to be the beast master. Well, we can’t help you with that. What we mean is we can’t help you with that…exactly. You won’t be flying to Africa, and taming the wild beasts. 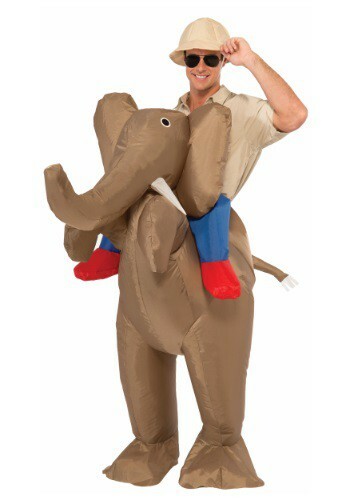 No, when you click “Add to Cart”, you will be buying this hilariously awesome Adult Inflatable Ride An Elephant Costume. You won’t have to figure out how to pay for a round trip ticket to the land of lions and elephants, or find a place to sleep in the Bush. Just slip on a khaki shirt and a pith hat, and become the explorer on an elephant that you were meant to be!